Many years in the future—at a time when much of Los Angeles is underwater and robots teach schoolchildren—a young cat named Ruthie is giving a class presentation about her ancestors. “My mom told me I come from a long line of strong female cats,” Ruthie explains proudly. “Princess Carolyn was the runt of 12 and it made her one of the toughest. Mom said she could take a lickin’ and keep on tickin’.” A flashback swims into view as Ruthie narrates the tale of a single day in 2017: When Princess Carolyn wakes up, she runs a successful talent agency, she has a loving boyfriend, she’s pregnant, and she’s happy. By the end of the day, none of that is the case. I imagine my great-great-great-granddaughter in the future talking to her class about me. She’s poised and funny and tells people about me and how everything worked out in the end. And when I think about that, I think about how everything’s going to work out. Because how else could she tell people? 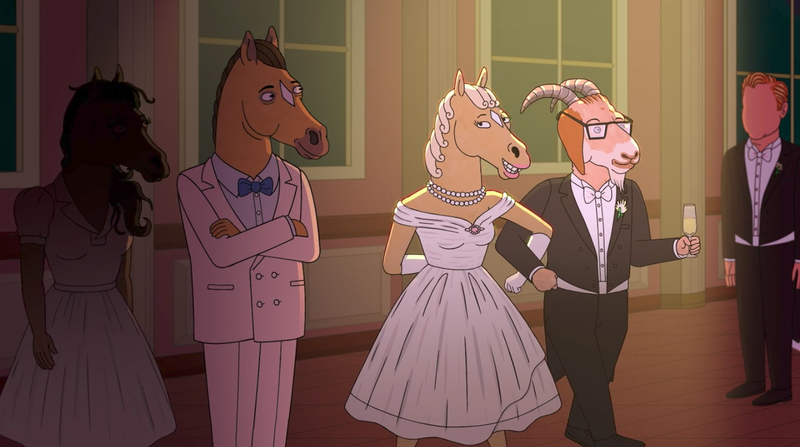 The reveal at the end of “Ruthie,” the ninth episode of BoJack Horseman’s fourth season, hits so hard because it’s one that viewers perhaps should have seen coming. After all, this is a show that has always held contentment and security just outside its characters’ reach. Yet the promise of a happy ending for Princess Carolyn, and the vividness of her fantasy, was too seductive to dismiss. The worse her day got (“You’re a real tough broad. Except for, you know, the uterus area,” the doctor says after informing her about her miscarriage), the more desperately she—and viewers—needed Ruthie to be real. Princess Carolyn’s tragic tale is a fitting companion to the other standout BoJack episode from this year. The season’s penultimate chapter, “Time’s Arrow,” tells the harrowing life story of BoJack’s mother, Beatrice, as filtered through her dementia. In part because of the show’s brilliant animation and formal experimentation, these two episodes make for glorious TV, taking full advantage of the medium to make their studies of female interiority feel like epics. Both “Ruthie” and “Time’s Arrow” keenly understand the ways in which their protagonists’ struggles are shaped by their experiences as women, and they illustrate in heartrending fashion how hostile realities can force people to seek out the comfort of stories. In its fourth season, BoJack Horseman took a notable inward turn, often rendering the psychological turmoil of its characters in strikingly visual fashion. Another excellent episode, “Stupid Piece of Sh*t,” enters the head of the show’s misanthropic star and exposes the depths of BoJack’s self-loathing: His inner voice berates him 24/7 for being stupid and worthless, as grim cartoons of his thoughts play out in his mind. (Later, BoJack’s putative teenage daughter Hollyhock tells him she hears a voice like that, too.) The episode “lovin that cali lifestyle! !” shows Hollyhock’s eating disorder–driven amphetamine overdose from her perspective—distorted voices, flickering lights, hazy colors—before she passes out. But “Time’s Arrow” is, even by this measure, a formally ambitious feat. Where the narrative trick of “Ruthie” isn’t apparent until the end, “Time’s Arrow” throws viewers off balance a minute in. BoJack, a supporting player in these two episodes, is driving his elderly mother Beatrice to a nursing home. Though Beatrice has a long history of emotionally abusing her son, she’s now suffering from severe Alzheimer’s and keeps calling BoJack “Henrietta” for some reason. Suddenly, she has a moment of lucidity. “Time’s arrow neither stands still nor reverses,” she proclaims from the passenger seat. “It merely marches forward. Isn’t that right, Henrietta?” The camera pans to BoJack, who’s no longer BoJack but a woman with her face scribbled out. “Yes, Mrs. Horseman,” Henrietta says, and the camera zooms out to show a much younger Beatrice. The background fades to white. Beatrice steps out of the car, now transformed into a small girl. Time’s arrow has, for a moment, reversed. What follows is a difficult-to-watch unspooling of Beatrice’s life—via memories that, because of her disease, melt and morph mid-scene. Characters’ faces are erased or violently scratched out. Words on signs rearrange themselves. The show doesn’t try to excuse Beatrice’s eventual abusiveness, but her painful past does offer context. Her father made his grieving wife get a lobotomy after their son was killed in World War II (silhouettes of Beatrice’s zombie-like mother haunt the episode). As a girl, Beatrice nearly died from scarlet fever. Her cheerily misogynistic father wouldn’t let her eat ice cream (to protect her figure), and would scold her for spending too much time with books. “Reading does nothing for young women but build their brains, taking valuable resources away from their breasts and hips,” he explains. “Time’s Arrow” suggests that Beatrice, once upon a time, was a lover of stories and the temporary escape they provided. With books to help stave off some of the horrors of her childhood, Beatrice grows up to be smart, poised, and eager to expand her horizons. But after college, she has a one-night stand with an aspiring novelist named Butterscotch Horseman and becomes pregnant—after which he seduces her with a wild idea. “Did you ever hear the story of the couple who moved to California?” he says. They imagine moving west, getting married, having the kid, living happily ever after—another shining fiction for Beatrice to seek refuge in. “And isn’t that how the story goes?” Beatrice asks with a smile. There’s a brief montage of happy snapshots documenting their attempts to live out this fantasy, which soon collapses. The couple’s marriage sours. Butterscotch’s writing career flounders. Motherhood is a nightmare—something Beatrice suspected all along. Soon enough, stories hold no magic for her; without that sanctuary, her memories again take on a more toxic sheen. “Time’s Arrow” shoots forward. In one scene, an older Beatrice says to her young son, “Mommy’s tired, BoJack. Tell me a story,” but then cuts him off, as if she knows exactly how the tale will end. Decades later, she mocks BoJack’s acting career.“I never understood the appeal. It’s just a bunch of silly stories,” she says of his sitcom. “Some people like silly stories,” he replies. Beatrice isn’t impressed: “Lotta good they ever did me.” To her, stories have now become lies; they’re no longer portals of possibility, but traps that will swallow you whole if you let them. Where Beatrice sees herself as a victim of the foolish fiction she and Butterscotch authored together, Princess Carolyn views storytelling as an act of resilience and control. Since Season 1, her character has been defined by a stubborn refusal to accept defeat, and by her attempts to “have it all”: a fulfilling career, a good relationship, a family. By inventing Ruthie, Princess Carolyn seems to profess her faith in the idea that a happy and well-defined future can corset an unruly past into order. So much of Ruthie’s commentary on Princess Carolyn’s day initially sounds like typical romanticizing of one’s family tree; in retrospect, it also feels like self-mythologizing. (“She had a lot of former lovers; she was a fluid sexual being not a machine,” Ruthie says at one point.) Part of the episode focuses on Princess Carolyn’s beloved heirloom necklace. “She never sold that necklace, because that was the one gift she could give her daughter,” says Ruthie, who’s shown wearing the chain. “A treasure from the past and a symbol of the tenacity and stick-to-it-iveness that has for generations led my family to always land on their feet.” After the necklace breaks, Princess Carolyn finds out that it’s actually a piece of cheap costume jewelry. “Somebody just told you a story,” a store clerk says when Princess Carolyn insists the necklace has been in her family for decades. With the loss of both her necklace and her baby, Princess Carolyn, in a sense, also lost her past and her future.“Time’s Arrow,” too, depicts Beatrice’s world closing in on her, only she’s suffocated by the very things Princess Carolyn longs for: a family inheritance, a partner, a child. As her memories decay, Beatrice’s past slips further away, and she holds only contempt for that piece of her that will continue on into the future: her son. Both women’s struggles, and the narrowing of their lives, stem from the fact that they bear the scars of existing in a world run by men. Princess Carolyn has long suffered her industry’s sexism and BoJack’s selfishness, while Beatrice internalized her father’s intolerance for what he saw as female weakness. Both characters have been denied the joys of motherhood. When her gynecologist informs Princess Carolyn she lost the baby (her fifth failed pregnancy), he amplifies the very real sense of guilt women often have after a miscarriage: “Maybe you just wanted the baby too much. Maybe you didn’t deserve it because you were unkind once.” As for Beatrice, her mother’s lobotomy and a traumatic memory of her father burning her baby doll reinforced the idea that it’s a mistake to love a child too much. It’s a lesson Beatrice shares with Henrietta, the maid that Butterscotch later sleeps with and impregnates: “Don’t throw away your dreams for this child,” Beatrice says, of the baby who turns out to be Hollyhock, BoJack’s half-sister. As accounts of heartache, “Ruthie” and “Time’s Arrow” end with quietly moving arguments for storytelling, not as a means of connecting with others, but as a more personal shield against the darker tides of life. Near the end of her episode, Princess Carolyn agonizes over whether to share the news of her miscarriage with her boyfriend Ralph. “She wanted to tell him, but she also wanted to let him stay in his beautiful, hopeful reality,” Ruthie says. “A reality she herself had lived in just hours before, and to which she now longed desperately to return.” Overwhelmed, Princess Carolyn doesn’t return to the home she shares with Ralph, but to her old apartment. “She wanted to go some place familiar. Some place that was just hers,” Ruthie says, perhaps also alluding to the private comfort of Princess Carolyn’s futuristic dream. Crucially, at the end of “Ruthie,” BoJack doesn’t, or perhaps can’t, show sympathy for Princess Carolyn’s thought experiment—as if he had absorbed his mother’s disdain for “silly stories.” But two episodes later, in “Time’s Arrow,” it seems Princess Carolyn’s words, in the end, may have resonated with him. BoJack is ready to leave his mother at the nursing home once and for all. “Best of luck. See you never,” BoJack says by way of a goodbye. But then his mother remembers him. “BoJack?” she asks, looking around confusedly at the room. “What is this place? I don’t understand … where am I?” BoJack angrily starts to explain but something seems to stop him. And rather than tell the truth—that they’re in a dingy room with a view of an overflowing dumpster, the room she’ll probably die in—BoJack tells her a story.